company profile of ESUN MATTRESS MACHINERY (NINGBO) CO., LTD.
ESUN MATTRESS MACHINERY (NINGBO) CO., LTD. Specializes in manufacturing mattress-making machineries. Our whole range of mattress-making machineries adopts America, Switzerland etc advanced standard of technology and design. Thus our machineries are more highly automated with high production rate and efficiency, saving more labour cost and power consumption, occupying less space and have longer life spans and many other advantages. 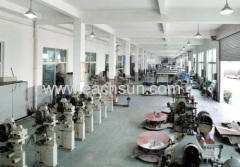 It include: spring machine, mattress machine, tape edge machine and so much equipments . All along, our company has continuously imports foreign countries advanced technology, combining it with our own Chinese technology to produce generation and generation of new machineries .Now, we are proud that our machineries have sold to all parts of the world: South-East Asia, America, Europe Africa, Middle East, etc. We have also appointed agents in many of these countries to provide better service and support for all our customers. Our company with our responsible, honest and always-improving attitude, strives to achieve better service and support for all old and also new customers.